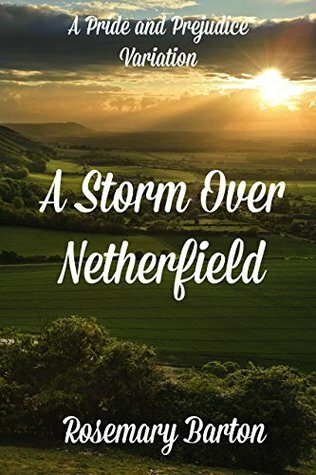 I bought A Storm Over Netherfield because I was compelled with the premise. In this variation Elizabeth hurts her ankle in the Netherfield woods during an unexpected storm that strikes precisely on the day she and Jane would return to Longbourn after their residence at Netherfield. I enjoy variations where characters are confined in one place because that allow authors to explore their interactions and focus on the characters dialogues, so I liked the beginning of this book very much. In it, Elizabeth and Darcy are forced to spend much time together and that enables them to get to know the other better which means they leave their prejudices behind and form a friendship. I enjoyed the beginning of the book when we see this happening, even if sometimes their flirting seemed a little modern to me, but I started to get a little distracted with the time that was dedicated to Caroline. She is the only villain in this story, and the author explores her point of view showing the reader that she is not a bad person, but someone who is desperate to get what she wants. This is an interesting point, and I admit I liked the fact that the author explored this character’s motivations, but I would rather not to read so much from her point of view. I also had a few issues with a letter Darcy wrote and that is quite relevant to the storyline. I cannot believe he would write something like that, it seemed out of character and an exaggeration. I believe that one thing is to make the “not tolerable enough to tempt me” remark at an Assembly when he is out of sorts, but another very different thing would be to write so emphatically about Elizabeth’s lack of beauty and proper behavior to a friend. Mr. Collins was a surprise, he was boring in the beginning but I did like his reaction to Mrs Bennett’s comments after the dinner party at her house. I had never seen an author take this approach which was funny and once more showed a talent to portray the secondary characters in a different and interesting light. Overall I think this book is interesting and I believe readers who enjoy romances without much angst will like it, but some aspects in it didn’t allow me to give it a higher rating. Thank you for this review Rita. I can see where it was conflicting in places. You really broke it down into sections so we can make our decision as to whether we want to read it or not. Thank you for your insight. I hope the review helps Jeanne 🙂 Thanks for visiting!! Hmmm. I’m not sure about this. I do like when Darcy and Elizabeth are thrown together so that is a plus but I checked it out and I prefer Caroline to be punished for her shocking behaviour. However with the promise of low angst I have added it to my wish list. Thank you for a great review Rita. Hmmm!!! Darcy criticised Lizzy’s attractiveness or lack there of and took her to task about her behaviour towards her friend??? In a letter??? Not sure about this one. Thank you for sharing your thoughts,Rita. Yes, that was my main problem with this book. I cannot imagine him doing so in writing because that kind of comment always appeared to me as something that happen in the spur of the moment, I would not imagine Darcy writing it… he is too much of a gentleman to do so. I did read this story and left a review. Thanks for sharing. Enjoyed your review and your honesty. I have added it to my wish list for now but agree that the issue of writing the insult down in a letter to someone would be out of character for Darcy. Thank you!